BOL ! BAM ! BOL ! BAM ! The importance of Jyotirlingam is well known to all in India. Its renowned sanctity is attached to the Hindu view of the socio-religious life of India. Jyotirlingam means the linga of light, i.e. a symbolic form of a stone tinctured with the cycle of light. It is a very surprising acknowledgment to us that the twelve lingas spray the rays of the light in the panorama of our life. It may be assumed that Jyotirlinga expels the proceeds of light which is generating with spiritual and cosmos consciousness for all. The light of Jyotirlingam is the light of cosmos which is realized by the power of soul as a whole. Being one out of the twelve Jyotirlingas, Baidyanath is famous for all. Deoghar, the home of gods, is modern name. In Puranas we find in its place names like Haridrapeetha, Ketaki van, Haritalik van, Chitabhoomi and Vaidyanath. In Bengal and upper provinces the place is generally known as Baidyanathdham. The sanctity of Baidyanath is mentioned in several Puranas which refer to it and as they are unquestionably the golden treasure of Hindu religion and culture, Baidyanath Jyotirlingam has attained great importance. The Baba Baidyanath temple complex consists of the main temple of Baba Baidyanath, where the Jyotirlingam is installed, and 21 other temples. The layout below will give an idea of how these 22 temples are laid out inside the campus. The Shiva Purana says that the demon-king Ravana, a great devotee of Shiva, wanted to take the lord to his land. Shiva told Ravana that he could take one of his 12 Jyotirlingas, which would be as effective as his presence. This was on the condition that Ravana would not place the linga anywhere on earth en route. The gods devised a ruse to stop him from succeeding. Varuna, the god of water, entered Ravana's stomach and the demon had to descend to earth to relieve himself. Vishnu, in the garb of an old Brahmin, appeared before Ravana, who requested him to hold the Jyotirlinga for a few minutes. But as soon as Ravana turned his back, Vishnu left the linga on the spot and vanished. Ravana returned to find the Jyotirlinga firmly fixed to the earth. In his frustration, he pressed it with his thumb and attempted to remove it. The linga thus acquired an indentation and tilted slightly, as it is seen to this day. Thereafter, he came every day from Lanka to perform his worship. The spot where Ravana came down to the earth is now revered as the Harila Jori. The place where the linga was deposited has come to be known as Baba Dham or Ravaneshwar Baidyanath Dham, popularly shortened to Baidyanath Dham. The Matsya Purana narrates the sanctity of Arogya Baidyanathitee, the holy place where Shakti lives and assists Shiva in freeing people from incurable diseases. Another legend of the Santhal tradition says that after the death of Ravana, the lingam used to be worshipped by a shepherd boy called Baiju. The dham and Jyotirlinga thus came to be called after him. The main temple was built by King Puranmal of Gidaur in 1516. It is said that the Palas of Bengal (8th-12th centuries) had extended their territory till Deoghar. In inscriptions found near the Tapovan Hill and Harila Jori areas, and near the villages of Sharot and Shator, there are references to Pala kings Narayanpala and Rampala, and evidence also indicates that the latter constructed parts of the temple complex. 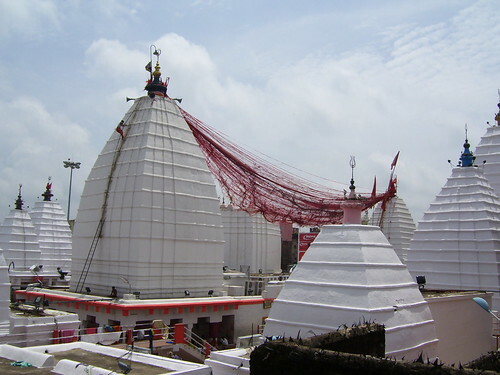 Baidyanath Dham is central to Deoghar Town. A clock tower looms over the central chowk's crossroads. The best way to get around is by auto (from Jasidih Railway Station, 1 km north-east, to Clock Tower costs Rs 25-35; shared autos charge about Rs 6-8 per person but watch out for overloading, particularly after 8 pm). From the Clock Tower, it is best to either walk or take cycle rickshaws because the lanes become very narrow and the temple administration does not allow autos beyond a point en route to the temple. From the Clock Tower, the Government Bus Stand is 1 km east and the stand for private buses is at Purana Meena Bazaar, half a kilometre away. A golden pitcher weighing 65 kg, donated by the queen mother of the Gidhor family, shines bright at the crest of the temple. An extremely rare and precious moonstone is mounted on the top of the crest from inside, which is said to have been brought by the demon king Ravana from the celestial merchant Kuber's capital Alkapuri. It is believed that droplets of water kept falling on the Jyotirlinga from the moonstone even though there is no known source of water on top of the temple. This phenomenon can be seen even today. All the 22 temples in the complex are painted white. There are shrines to Parvati, Jagatjanani, Ganesha, Brahma, Sandhya, Kalbhairav, Hanuman, Manasha (the serpent goddess), Saraswati, Surya, Ma Bagala (one of the shorshi, ie, 16 forms of Kali), Ram-Lakshman-Janaki, Ganga-Jahnavi, Ananda-Bhairav, Gourishankar, Narmadeshwar, Shiva, Tara, Kali, Annapurna, Laxminarayana, Nilkantha and Nandi. Of these, the main temple to Shiva as Baidyanath and the temple to Parvati, 30 yards to the north-east, opposite the main sanctum, are the most revered. Shiva presides here as the supreme physician. Constructed 75 years ago by a pious widow, Rani Charushila Devi, is this 146 ft tall white marble temple with impressive pillars and black idols of Radha and Krishna. As it cost almost 9 lakh rupees to build back then, it earned the name 'naulakhya'. On the eastern outskirts, a panoramic view of Deoghar can be had from a hillock called Nandan Pahar (3 km from Clock Tower; there is also an amusement park here, which is open 8 am-8 pm). A huge idol of Nandi is to be seen here. Harila Jori (5 km north-east) has a temple to Shiva as Haritakinath, situated in what was once a grove of hartaki (myrobalan) trees, of which only two giant specimens remain. Trikut Pahar (18 km east), also known as Trikutachal, is a 2,470-foot high hill comprising of three peaks and thus the name. There are many wood apple trees here and devotees come to collect their leaves in the month of Shravan, giving this scenic spot the title 'the garden of Shiva'. The Trikutachal Mahadeva Temple here is also the origin of the River Mayurakshi, a stream that makes this site a picnic spot. Tapovan (10 km north-west) is said to be the place where Ravana meditated. The pond adjacent to this temple is called Shul Kund. Note that none of these sites have fixed timings and it is best to cover them as a day tour, starting early by, say, 7 am, to return by sunset, or even earlier. Pilgrims make it a point to pay homage to the black granite idol of Lord Krishna at the Basukinath Temple (45 km north-east of Deoghar, on the way to Dumka). The dam across the River Mayurakshi at Masanjorh is a tourist attraction (145 km south-east; open 9 am-5 pm). On a normal day, the worshipping of Baidyanath Jyotirlingam begins at 4 AM. The temple doors open at this time. The Head priest worships with Shodashopachar. Then the devotees begin their worship of the lingam. The most interesting tradition is that priests of the temple pour kuchcha Jal upon the lingam first later on other pilgrims pour water and offer flowers and Vilva leaf upon the lingam. The Puja rituals continue till 3.30 PM After this the temple doors are closed. In the evening at 6 - 9 PM the doors are opened again for devotees/ pilgrims and the process of worshipping begins. At this time Shringar Puja takes place. Scent is spread over the lingam. Again a stream of water is poured over the lingam. Sandal paste of Malayagiri is also pasted on the head of the lingam. There is an interesting tradition that a snake like throne of flowers (Jata Mukut) is also placed on the lingam which comes regularly from the Deoghar Jail since the British time. How to reach Babadham ? 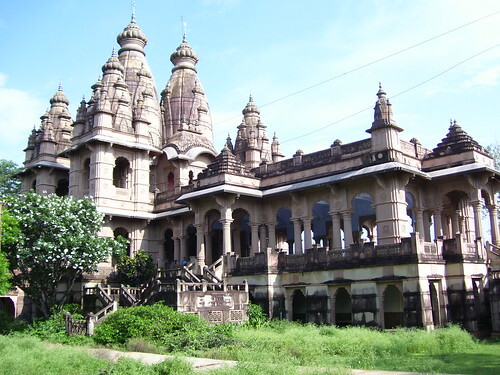 Babadham is located in north-eastern State of Jharkhand, four miles from Jasidih railway station on the main line of the Eastern Railway from Howrah to Delhi. There is a small railway branch line from Jasidih to Babadham. The railway station at Babadham is called Baidyanath Dham. Babadham stands near the G.T. Road connecting Calcutta with Delhi. From the G.T. Road, you can take a turn to the state road at Bagodar or at Dumri. Devotees coming down from Kolkata or other parts of West Bengal can take the route via Jamtara. In the North-East Dumka, Rajmahal and Bhagalpur; in the North-West Munger; in the West Hazaribag and in the South Giridih district border the region. Passenger buses run regularly from Ranchi, Jamshedpur, Hazaribag, Bhagalpur, Dumka, Patna, Gaya and other places in Jharkhand and Bihar to Deogarh. 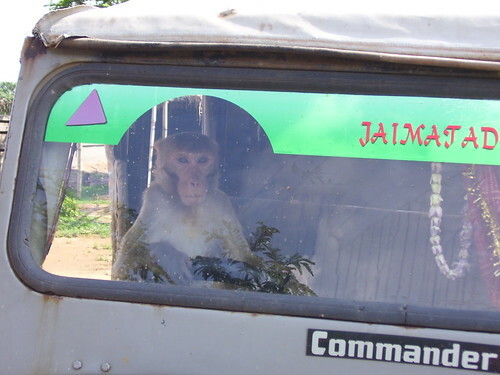 Taxis and Rickshaws are available at Babadham and at Jasidih railway station. Nearby Airports are - Ranchi, Gaya, Patna and Kolkata. By road Babadham (Deoghar) to Kolkatta 373 kms, Giridih 112 kms, Patna 281 kms, Dumka 67 kms, Madhupur 57 kms, Shimultala 53 kms etc. Approximate journey time is 6 hrs from Munger,Ranchi, Dhanbad; 3 hrs from Sultanganj and 4 hrs from Bhagalpur & Hazaribag.